occasionally i feature shops that are undiscovered, i like to browse through etsy's pounce feature. so many lovely new up and coming artists: for all you shop owners you remember the days when you first started your shop. it was all so exciting when you made your first sale. ;) check them out and support! i'm a huge fan of etsy's pounce feature too! these are some great finds danni! i'm particularly a fan of the flower ring and the mug! i just looove the mug! I just used pounce for the first time the other day (I know, can't believe I hadn't used it before, lol). Love it, but what I love more are these items. All lovely and I want that mug! thanks! had no idea there was a pounce feature - too cute! This whole collection is so lovely! I love that bag. I'll have to check out that pounce feature. Have a lovely day! i like the colors of those towels! Sometimes I think there's a reason why shops haven't had a sale....but these items are lovely! Love the mug. those amazing towels are incredible! These are all so beautiful! I love that ring necklace and the porcelain mug. Amazing the things you can discover on etsy . . .
Ohhhh ... I want that rings necklace, it's beautiful! I am so obsessed with etsy. Loving that precious mug!!! I love delicate kitchen things like that!!! This is a lovely inspiration!! Your blog is precious and makes me smile! What a lovely thing to read. And love these new shops! You have a lovely blog. You are now my new blog crush! sweet mug and what i thought was just a bolt of fabric, the towels. I love all of those items you featured! It is so neat that you feature other shops items. :) I am new to blogging (my blog opened yesterday :) ) and love your header and blog design! I plan on checking out your design site. 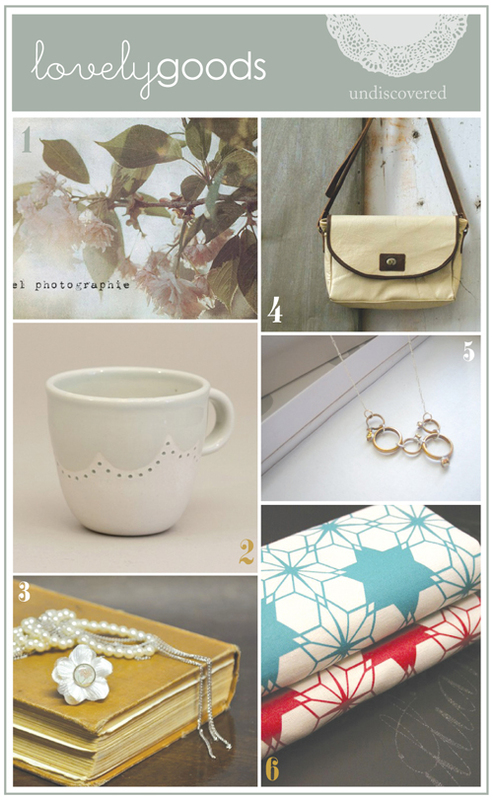 I love how you feature undiscovered stores on Etsy! I recently opened a shop and it's a challenge to get the news out. Al your photo collections look wonderful, you have a great eye for displaying adorable items together! 2 and 5 are absolutely stunning! checking the shops right now! hope you are fine, dear. Those kitchen towels are beautiful. That shop is a great find, thanks for the link!